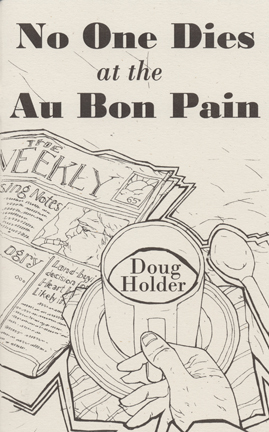 "No One Dies at the Au Bon Pain is...engaging and accessible. The topics are self reflection and relationships, especially those that end. He still exercises that eye for the absurd amid the mundane.... Doug Holder [is] a poet of the people, not absorbed in navel gazing language games but reaching out and shaking readers awake." "Holder's work here is rich with textual imagery. A stranger's laugh becomes an 'astringent mixture of the hilarious and sinister.' Rain is a 'spectral tapping on the roof.' These are words of a master poet who sees the world clearly and shares that vision generously with readers." "These books are printed and produced in the finest tradition of the small press: well laid-out and speaking to the mind rather than mass market. Centers of artistic energy seem to move around the country periodically, and it’s good to see rare meat on the finest tables again." "Amazingly effective, what we have here are classic, condensed meditations on what it's all about in a context of eventual anihilation. A volume to be on the shelves next to Keats, Whitman, Rimbaud."